150 miles along Baja’s Pacific coast. 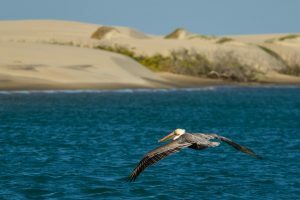 The lagoons and tributaries of Magdalena are home to over 250 species of birds, wild coyotes, dolphins, and the trip highlight— gray whales. 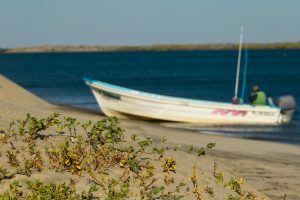 The lagoons of Magdalena are accessible through two fishing villages situated at opposite ends of the Bay. Lopez Mateos is one of the villages and is located on the northern end of Magdalena. A short drive from Ciudad Constitucion, rows of orange trees line the highway and street lights topped with osprey nests signal your arrival to Lopez Mateos. Local fisherman and residents have worked very hard to protect this treasure from the growing threat of commercial fishing. They established a co-op to make sure profits from ecotourism are shared and kept within the community. 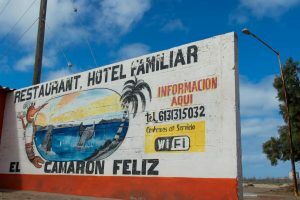 One of the local hotels, such as the Hotel Familiar, will welcome you in for a siesta before you head to the lagoons for the real action. 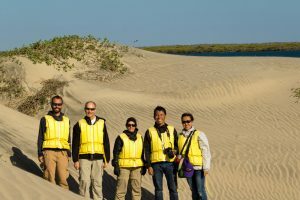 If you get a chance, ask any of the locals their thoughts on the lagoon and you soon see how much they care about the mangroves and gray whales which inhabit the area from January through March. 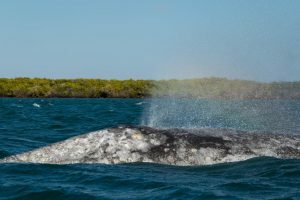 Gray whales tend to be seen beginning in January as these whales finally reach their breeding grounds off the coast of Baja California. They make one of the longest migrations of any mammal, traveling up to 12,000 miles annually roundtrip. 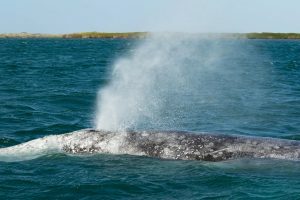 Gray whales are baleen whales, which reach a moderate size between 30-50 feet as adults and can weigh up to 100,000 pounds. Females are slightly larger than males. 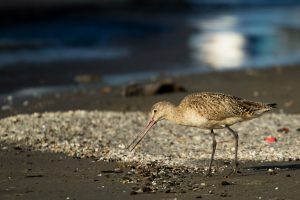 Scientists are unsure as to how long these creatures can live, but the life span is believed to be anywhere between 40 and 80 years, with supporting documentation of species over 80 years old. The eastern North Pacific gray whale population, those that winter in grounds along the Baja peninsula, spend their summers in feeding grounds throughout the Chukchi, Beaufort, and Bering Seas. They feed mainly on benthic invertebrates found in the muddy ocean floor, preparing for their long migration south. 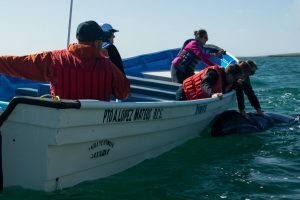 Once on their way, these whales are on a direct path to one of the three lagoons of Baja California: Ojo de Liebre, Laguna San Ignacio and Magdalena Bay. These are the only places in the entire world where the gray whales give birth. 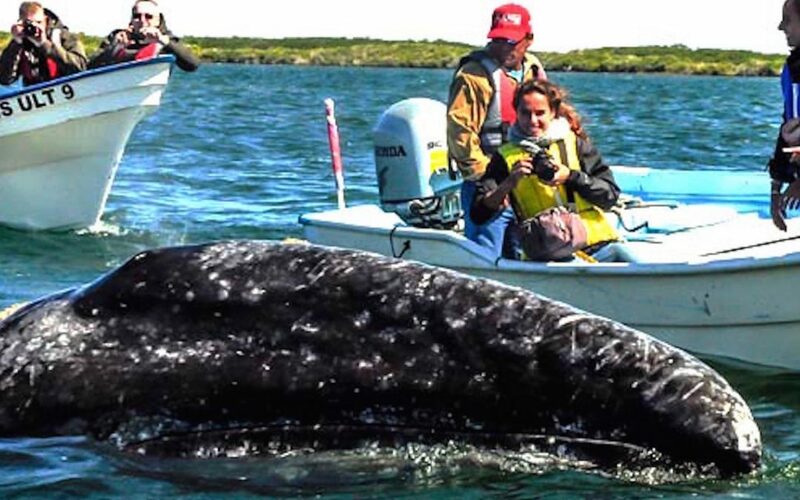 After two months of swimming the whales finally reach the lagoons of Baja California. 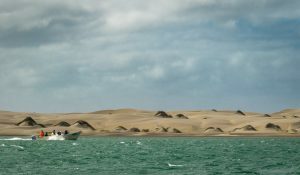 The shallow lagoons are usually warmer than offshore waters and are perfect for the calves to feed, swim, play and gain strength for the long trip back North. These curious creatures will sometimes come right up to the side of a boat, allowing guests to pet them and even kiss them! It is said they enjoy this interaction due to the itchy barnacles they have growing all over their head. 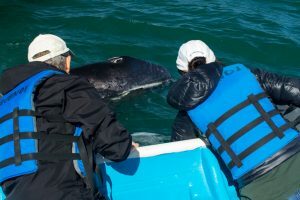 If petting the whales is not enough, there is plenty of other life to see as playful dolphins and sea lions can be found frolicking with the whales. 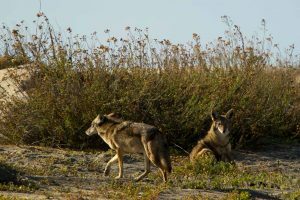 Coyotes can be seen to the East scavenging fish on the sand dunes, while pelicans and herons dive for baitfish throughout the mangroves. This is a place that you will definitely need more than one day to explore. Possibly in a week you could experience all of the different habitats that are packed into this wildlife haven. 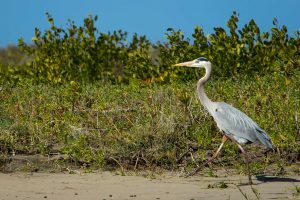 From on a boat in the lagoons, to a kayak in the mangroves, to a day hike on the impressive sand dunes, there is never a dull moment for an outdoor enthusiast. 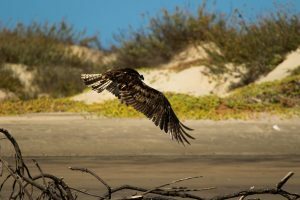 All these interactions make Magdalena Bay one of the best locations to encounter wildlife in all of Baja California Sur, possibly all of Mexico. 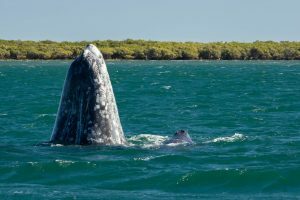 If you have an extra day to explore Baja, do not to pass up the chance to visit Magdalena Bay and its playful gray whales!